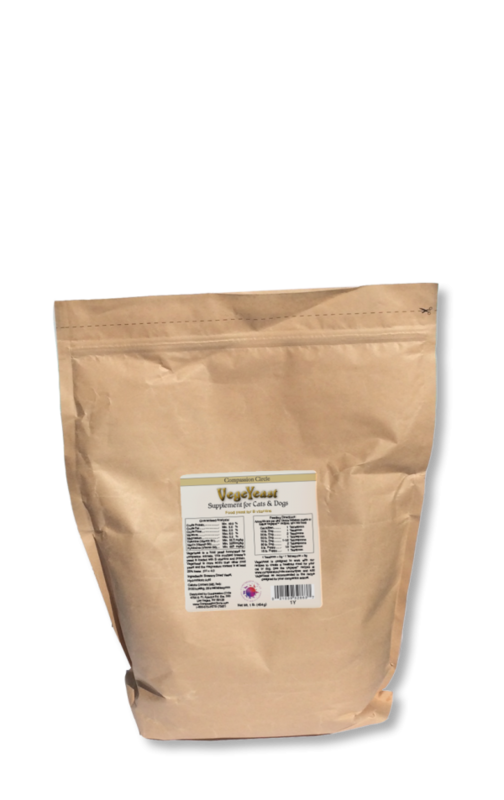 VegeYeast is a modified brewers yeast that contains B vitamins and protein, specially formulated for companion animals. 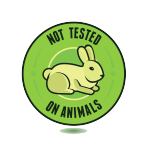 It is especially important that you use VegeYeast in your plant-based cat or kitten recipes. We prefer getting essential nutrients from whole foods as much as possible, rather than adding individual vitamins in an attempt to compensate for inadequate meals. That’s why we recommend VegeYeast. It’s loaded with the important B complex water-soluble vitamins to support the nervous system as well as many other functions in the body. It is an excellent natural source of chromium and high quality protein. VegeYeast is more acid than other yeasts, with a pH between 3.2 and 3.7. It is also lower in magnesium. Extra acidity in the diet is beneficial for both dogs and cats, and lower magnesium in the diet helps prevent magnesium buildup in the kidneys or bladder. Minerals that aren’t flushed out of the urinary tract can contribute to stone formation in an alkaline environment. Feeding wet food will improve urine concentration and help minerals flush from the system. 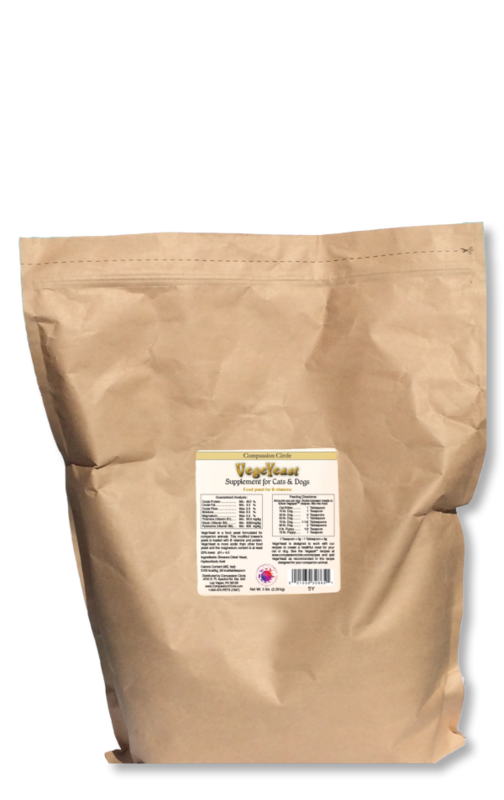 VegeYeast helps make the transition to the vegetarian diet that much easier since both dogs and cats love the flavor that it adds to their food. 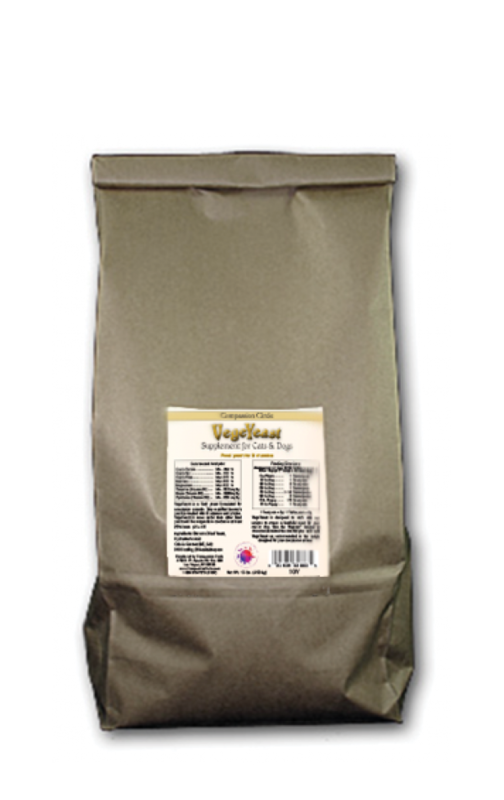 Vegepet recipes require about 1 pound (454 grams) of yeast per month for a 10 pound (4.5 kg) cat or a 44 pound (20 kg) dog. Daily serving sizes are on the VegeYeast labels. 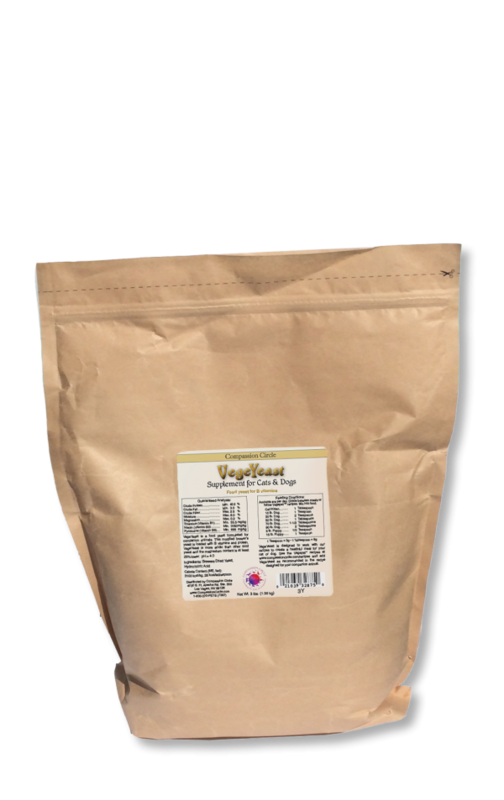 Our yeast is made from a one-celled fungus called saccaromyces cerevisiae. The Dutch have been cultivating this strain since at least 1780.